Happy Mother's Day to all the moms out there and to those who follow this blog. And yes Happy One Year Anniversary to my blog as well. I remember very vividly, last year on this same day I was in bed, recovering from my first two surgeries. And if I wasn't working, I was continuously watching Food Network on TV. I thought to myself maybe this was the right time for me to start something I had always wanted to - start my own food blog, which would help maintain my sanity as I recovered very slowly from my surgery, and maintain a positive mindset. I am really happy that I acted on it, and it has been a year since then. It has been worth it. I will continue to get better this year and bring some really good recipes for everyone. Thanks for your support, to all you readers out there, and my wife and family who have encouraged and pushed me in this endeavor. Last week in my post, I had mentioned about the two masalas I am very fond of currently. I prepared this fried rice using Priya's biryani masala powder. Buy Nanak paneer from any Indian store. It comes in a 450g block size. Cut off about 150 grams of paneer from this and cut into 1/2 inch pieces. In a small non stick pan, on medium heat pour around 1/2 tbsp oil and pan roast the paneer cubes until they are golden brown. Set aside. In a wok or a similar pan, on medium heat, add 1 1/2 tbsp oil, the cayenne pepper and stir a little. Immediately add the red bell peppers, green beans, biryani masala powder, and a pinch of salt and continue to stir until the vegetables are done but crunchy. Add the rice, paneer, and salt to taste, and mix everything well so that all the ingredients get incorporated into the rice and paneer. 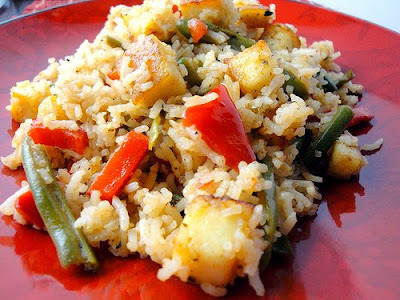 Serve this delicious fried rice hot.